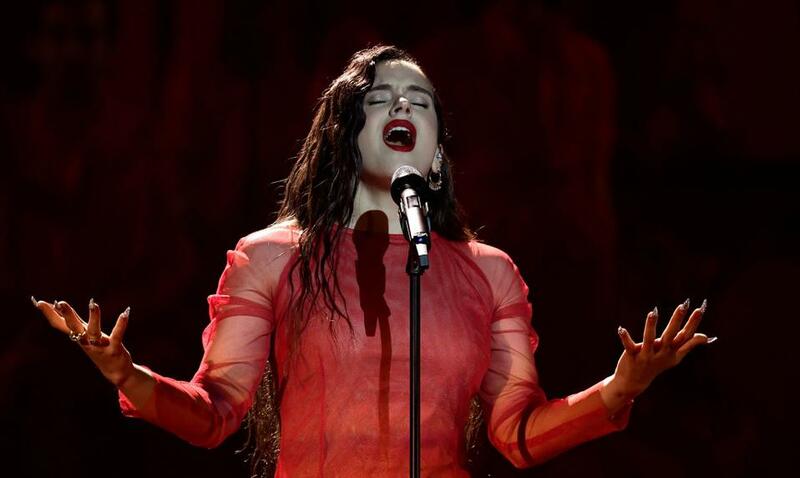 The performance by Rosalía alongside the Cor Jove of the Orfeó Català and El Guincho, directed by Esteve Nabona, at the Spanish film academy’s 2019 Goya Awards ceremony, held on Saturday, 2 February in Seville and broadcast live on TVE, made a huge impact and was fully deserving of the media attention. The artists performed a version of Los Chunguitos’ ‘Me quedo contigo’, arranged by Bernat Vivancos, a song that originally became popular thanks to being featured on the soundtrack to Carlos Saura’s 1981 film Deprisa, deprisa. The extraordinary voices of the Cor Jove youth choir and the amazing and passionate Rosalía, with the arrangement by Vivancos, provided an intimate, melancholic and mystical version of ‘Me quedo contigo’, a far cry from its original style (a mixture of gypsy rumba and Spanish melodic song). Los Chunguitos loved it, and the praise for this performance won’t be in short supply. The content of the performance itself was a closely guarded secret right up to the last minute and it was well worth the wait. ‘Rosalía and the challenge of getting everyone at the Goyas talking. Her version of “Me quedo contigo” eschews more conventional music’, was Núria Juanico’s headline in the newspaper Ara, while Maricel Chavarria noted, ‘Rosalía doesn’t do anything without intention. She decides by art and for art. And when the Goya Awards ceremony asks her to take part in the event, she does her research, searches, does some digging and comes up with a surprise’ in La Vanguardia. The impact of the performance surpassed the figure of 1.5 million views on YouTube in just 24 hours. At the time of writing this article, eight days later, the counter is at... 5,564,959 views! And it keeps going up! Still haven’t seen it yet? Well, what are you waiting for? Behind the singer, literally, the Cor Jove of the Orfeó Català took the sound to another level. But how did this collaboration come about? Choir director Esteve Nabona explains. ‘When we got the proposal to perform with Rosalía at the Goya Awards ceremony, it was hard for me to picture how we’d be able to fit in. A little more than a year ago, the Cor Infantil children’s choir had collaborated with her on the song “Bagdad” from the album El mal querer and it was a really good experience. This time, however, the cover was of a song by Los Chunguitos. There were just over two weeks to go until the ceremony in Seville and we didn’t even know what the score would be like. Rosalía, Los Chunguitos, the Cor Jove of the Orfeó Català... I was missing one ingredient to bring this recipe together’. The challenge was on the table. Bernat Vivancos is the artist behind the arrangement. Three weeks before the Goya Awards ceremony, Rosalía got in touch with the composer, whom she already knew, to entrust him with a very specific task: a cover version of the Los Chunguitos song ‘Me quedo contigo’ for choir, that she would sing with the Cor Jove of the Orfeó Català, in a demanding live performance during the televised Goya Awards ceremony. ‘I immediately thought she was very brave, she was taking a big risk: asking a contemporary composer to adapt a song that’s so well known and so characteristic, and to do it at the height of her popularity. Asking me to create the cover version was already a statement of intent. She knows what I do and she knows my musical style,’ explains Vivancos. This virtual reality ended two days before the ceremony, in Seville, where everyone was finally able to rehearse together. ‘And the magic happened,’ says Nabona. ‘Rosalía is a young woman who knows what she wants, a coherent artist, well trained musically, a perfectionist, demanding and extremely sensitive and musical.’ There was also participation from ‘a piece as subtle as it was key’: El Guincho, the alter ego of musician Pablo Díaz-Reixa, a native of the Canary Islands and keyboard player, producer of Rosalía’s last album and someone she trusts. His role in the performance was very specific: ‘He added a low voice with an instrument, which helped give it a bit more body and sound range, but without losing the character of an a cappella choir,’ explains Nabona. ‘The success of the cover?’ Vivancos asks himself. ‘I really believe that Rosalía is an artist who likes to surprise and, like it or not, she does something interesting that all great artists do: she gets people talking’. The composer believes that ‘audiences look for novelty, originality, to be shaken up, and that’s what we did’. A performance and a cover version that will undoubtedly go down in the history of Spanish music. But... Did you know that other singers have covered ‘Me quedo contigo’? For example... Manu Chau and Antonio Vega. Do you want to hear them? And the original song by Los Chunguitos? Then click here. 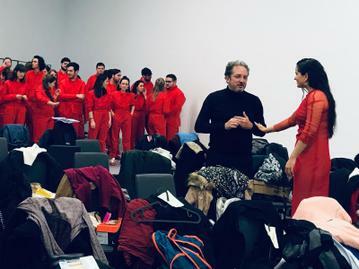 This collaboration with Rosalía has certainly been an unforgettable experience for the singers of the Cor Jove who took part, on both an artistic and a personal level. It was a unique opportunity to experience and form part of this great celebration of Spanish cinema that’s one the most important national cultural events. Víctor Luis, a bass in the Cor Jove, explains that during the rehearsals ‘we couldn’t have imagined what that Saturday night would mean and the whole experience around the Goya Awards. Beyond the huge impact and the great reception that 3-minute performance has had, we feel that we’ve been part of a big TV production in a format that was something new to us up to now’. Víctor tells us that ‘during the three days we worked with her, we saw her most authentic side behind the public persona, and she seemed very down to earth, humble and nice’. For Júlia, ‘it’s been a privilege to see how she was working, how she was changing little parts of the piece and was asking us for little touches so everything was perfect’. Finally, Jordi Martí, from the Palau de la Música’s Accounting Department, is the employee who accompanied the Cor Jove to Seville. (The Palau gives its employees the opportunity to accompany the choirs on some trips to help with organisation and share the experience). Thrilled to have the chance to be part of this event, he tells us that ‘everything went smoothly. The singer was down to earth and unassuming, but also very professional and a perfectionist, and she didn’t want to leave anything to chance. We were able to chat with her and take photos and we already had the feeling that everything would go well’. For Jordi, ‘the moment of the live performance was the most exciting, and I was able to follow things from backstage, close to the singers and surrounded by everything that was happening, and even some celebs’. At least for this Palau employee, ‘the most enriching part of the experience is having witnessed the work of my colleagues who make sure that all the performances – in this case the one by the Cor Jove – are perfect and overcoming all the obstacles without losing their good humour and calmness, which also ends up spreading to the entire group of singers’. 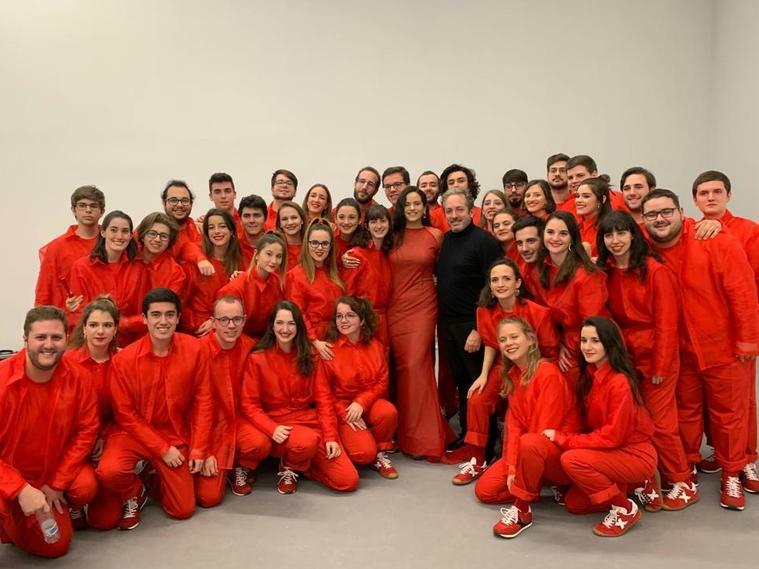 As Nabona explains, it’s not the first time that Palau de la Música choirs have collaborated with Rosalía. 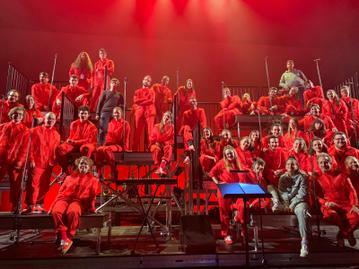 The Cor Infantil of the Orfeó Català children’s choir was involved in the song ‘Bagdad’ on her album El mal querer. It was her second album, which she wrote herself and was produced by El Guincho, released by Sony Music and that came out in November 2018. Will we see a future collaboration with another Palau choir? One more thing... Did you know that Rosalía performed at the Palau as part of the family show Flamenkat, produced by the Palau itself? Well, now you do. You can watch the video in the digital archive.